I think it’s an awesome idea, and it’s great that Mattel is testing the retail waters for MOTUC. I predict this thing flies out of stores. The He-Man figure is something of a redeco, particularly the belt, the shield, and the “glowing” yellow Power Sword. The 2-pack comes with a copy of DC Comics Presents #47, the issue where the two characters first met. It looks like there’s going to be a Skeletor 2-pack as well–again, with Skullhead repainted in comic-inspired colors–though which DC character it will come with is unknown (there’s no one other than Superman in either of the cross-overs, so maybe a battle-damaged Supes?). Will I pick up this set? Probably, if I actually see the thing at TRU. Again, I have a hunch these will be vanishing instantly. Eh, I'm not sure I want MOTUC in stores. I don't really want to see them cutting corners to get the price down if they tried to make a retail wave, like using that atrocious rubbery plastic they use on a lot of DCUC figures, cutting back on accessories. ect. This is exactly what Toys R Us needs! By offering actual exclusives, they'll be able to get people in their stores. Also, getting these figures to mass retailers is a good thing – it means that they're making money off the molds finally. I doubt there will be a degrade in quality. Sure, maybe fewer paint apps but this is looking like its solid profit for Mattel. Plus, I'm willing to bet Toys R Us ordered more He-Man figures than have been sold by Mattel so far. Awesome! My only problem is I don't want however many Superman figures laying around just so I can have MOTUC. Some of the people on the Matty forum and other boards out there have truly bizzare demands. A guy posted he wouldn't beuy it unless Superman was on a MOTU Classic body. How strange would that look? And I think its great to see MOTU being sold at TRU again. If its brought back as a full line to retail, then there will be retail distro problems like DCUC but it leaves the door open to release more playsets and vehicles! @Dan C.: I'd actually like to see a MOTUC-style Superman–it would be easy to do, and it would really just look like a McGuinness Superman–but that doesn't mean I won't buy this pack. Well,I've complained enough here and elsewhere about these not being sold in the brick and mortars,so I'm buying this set and I guess the Skeletor one too (allthough it would be weak if he came with another Supes.) I like DC almost as much as MOTU,so I don't mind the two packs-plus I love that comic story. My lady and I often quote it. Of course,as Poe said,that's –IF– I can find it at retail. If I have to buy it online from Scalpor,I might as well buy it from Matty. That being said,other than this one dude who looks like Willie Nelson,I don't think there's too many he-fans in my area. Great news! I wouldn't be surprised if a Superman vs. Muhammad Ali set was in the wings as well, due to the reissue of that old comic book. I am totally gonna get one of these. I don't have a He-Man and this looks like a fun way to add one to my collection. I'm pretty sure Mattel would've dropped MOTUC a long time ago if they weren't making money off the molds. I think it's awesome that they're giving MOTUC some kind of retail release, and this pack is a fairly cool idea. But is it really a fair test of viability to saddle He-Man with a re-released Superman figure that everybody already has? I hope that the pack meets whatever goal the Mattel folks have in mind so that they'll be willing to give MOTUC a chance on its own. @Valo487:I think I have to agree. The paint apps and plastic used in DCUC is terrible, so I guess I prefer MOTUC to stay an internet exclusive. Anyways, this 2-pack is pointless to me if Supes is just going to be his DCUC style figure and not a MOTUC style figure. Although, actually I'd prefer a DCUC style He-Man, which would fit in perfectly with my 200X collection. I agree with Sympathy. Why wouldn't the collectors who were paying 28 bucks for one guy pay 30 dollars for 2 plus a comic? If you already have the Superman,give it to a kid or something. The last Supes I got was the DCSH one way back when,and it smells strange,so I wouldn't mind an upgrade. Like Poe, I'm highly doubtful I'll actually ever see these in a store, but on the off chance I do I think I'd pick it up and keep it in package. I heard Batman is suppose to come with Skeletor and I'm willing to bet it will be the 5 pack version. I also think a "Aquaman vs Merman" set would be really cool. I just can't get excited about this. The Superman looks great, but I have no interest in He-Man and also already own about 6 Mattel Supermen, so won't shell out for this set. It's nice that other folk are pleased though, especially if it makes buying for the MOTUC fans easier. I just can't get myself excited about MOTUC for some reason. Oh well! Since TRU in the UK don't stock DCUC I doubt they will get this. Still say MOTUC needs released at retail. I'm a little skeptical about where this will lead. As long as Mattel keeps making the online-only versions, and doesn't start releasing figures available exclusively through retail, I think I'll be okay with it. @Dan C.: point one… take a he-man body, slap a PE supes head on him BAM! instant mcguiness supes! point two… cuz DCU has all those cool vehicles and playsets? This is a much cheaper way to get a regular Superman(no red eyes, short hair) than it is to buy the WalMart DCUC set. I don't have any MOTUC yet, so this whole thing is exciting. Crossovers are ALWAYS awesome. Always. They are the pinnacle of geek fun, even though the stories are rarely very good. I would buy a damn Ghostbusters VS ALF 2 pack if it showed up. So, I guess I will finally be getting a MOTUC figure after all. If I can find this in a store, anyway. I might grab these for the He-Man and Skeletor figures if I don't own them by the time they come out. Otherwise pass. @Snakeeyes22: I think a Ghostbusters vs. Alf 2-pack would be awesome! A 4H sculpted Alf with DCUC level articulation? WIN! Or, actually i don't care as I have them both multiple times anyway…. 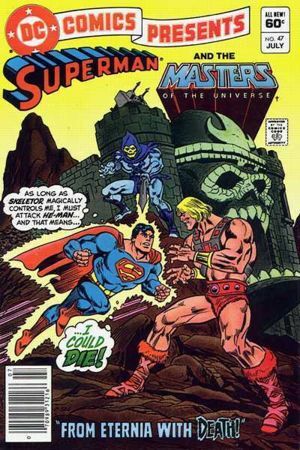 I kind of agree with Fengschwing, especially since there have been 5 or 6 DCUC Supermans (and probably more down the line), but I liked He-Man as a kid, so I'd probably buy this and keep it in the box. I know–sacrilege! I'd rather they didn't make a MOTUC Superman; Masters always had it's own style and it should stay that way. @Dead Man Walking: I don't know what you're talking about with paint apps and plastic–I just got Iron and he is perfect and looks like metal. I've also seen a fair number of pictures of Adora with messed up paint. I do hope though, that those sets perform well. And that Mattel somehow manages to offer international collectors a chance to order them. @MysteryD8: I'm mildly intrigued by these; but a Superman and Muhammad Ali set would have me bouncing off the walls like an 8 year old kid gooned on Pop Rocks and Coke. Also, thanks for the laugh, Snakeeyes22; the thought of a GB/Alf set- well, an anything with Alf set is both hilarious and awesome. I'm hearing a lot of people jumping on the MOTUC train after this. Makes me think Mattel may be forced to go retail. Awesome idea! I love ALF! But it would have to be a 5 pack, to be sure. I read somewhere that the Superman in the 2pk will be a lighter blue than the previously released Gotham City 5 and All-Star figures. Hey,I've been saying the whole time that if MOTUC were avaiable at retail,I'd have a whole set. They're great figures,but unfortunately I don't have 30 dollars to spend on a 6 inch action figure every month,nor do I feel I should have to hit refresh on my browser during a one hour window of sale for said 6 inch figure. if MOTUC were avaiable at retail, I’d have been locked up by now for having gone one a mass murdering spree for not being able to find anyone.